Security is a serious business. We advise industry, businesses and government on custom security solutions. Identify and mitigate your risks with our security risk management expertise. Protect your people & premises with our security guards. Protect your cash & valuables with our armed officers. Empower your staff with security training that understands your business. The security company Sydney trusts, since 1987. 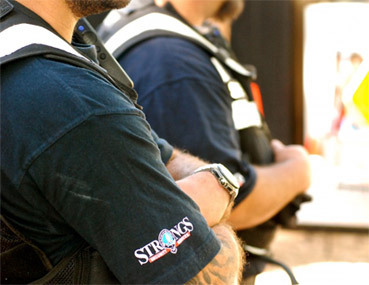 Strongs Security is an established name in security and risk management across Sydney and NSW for almost 30 years. Your security is a serious business. Whether you need guards, training, risk assessment or a security consultant to advise you, Strongs Security have the people, skills and experience your business needs. To protect and serve organisations with an attitude to security services that is always ‘mission critical’. To empower clients with affordable risk management solutions, & the security to do business with confidence. Strongs Security is a licensed Master, Consultancy and Training provider involved in the security industry since 1987. Strongs’ is committed to providing its clients with security services of the highest calibre and assisting its clients to mitigate security risks within their work environment.